• St Annes is an impressive modern executive villa which sits in one if Glasgow's most desirable enclaves of modern construction. Accommodation comp 5 bedrooms, 2 en-suits, bathroom, cloaks, shower rm, lounge, sitting room, dining rm, dining kitchen, media room, pool complex with sauna and shower rm and utility room. Southerly gdns, drive, electric gates, garage, G.C.H, dble glazing, alarm and CCTV. 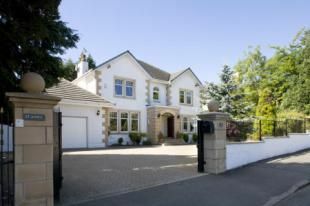 "St Anns" is an impressive modern executive villa sitting in the Higher Whitecraigs area of Glasgow's South side, believed to be one of Glasgow's most desirable enclaves. This area is known for its easy access to the city centre and Glasgow's International Airport. A short distance from Higher Whitecraigs you have a railway station and there are many golf courses within easy reach. This property is of modern construction and is in exceptional condition with spacious accommodation over two levels. It has a leisure complex with a swimming pool, shower room and sauna. The current owners have meticulously maintained and upgraded this property in recent years and have successfully created a stylish and contemporary family home with an impressive specification. Specifically all the bathrooms and en-suites have been up-graded and the kitchen has been modernised. Internally, the accommodation extends to impressive reception hallway which leads to all lower apartments. On the ground floor there is formal lounge with fireplace, sitting room, dining room, fully integrated kitchen with island and dining area with range oven, American fridge freezer and dishwasher. Media room which is fully integrated with gaming consoles and is all beautifully finished with black glass storage units. You then have French doors which lead through into the leisure complex where you have a swimming pool, wet room with W.C. And sauna. The leisure complex is surrounded by glass on two sides and enjoys outlooks into the gardens. You then have a utility room with an access door into the garage and finally you have a cloakroom and W.C, again just been re-fitted with Porcelonosa tiling and Porcelonosa sanitary wear. On the first floor you have five double bedrooms, the master has its own dressing room and an impressive four piece bathroom, all fitted with Porcelonosa tiling and an in-wall tile television and all with Porcelonosa sanitary wear. The guest bedroom also has a re-fitted shower room. All the other bedrooms have fitted furniture and then finally you have the family bathroom which is a spacious four piece bathroom with in-wall tile television. Externally, the property sits in a level plot with landscaped gardens. Southerly rear gardens which do enjoy a high degree of privacy, surrounded by mature trees and hedgerows. There is a level lawn and a children's play area. You have paved patio area which sits to the rear of the house which can be accessed from the leisure complex and the kitchen. To the front of the property you have a driveway, accessed via electric gates and an area large enough to park several vehicles. There is also an integrated garage with internal access to the house, this is fitted with an electric door. The property specification includes gas central heating, double glazing, security alarm system and CCTV. Lounge18'8" x 15'1" (5.7m x 4.6m). Sitting Room15'2" x 15'1" (4.62m x 4.6m). Dining Room15' x 10' (4.57m x 3.05m). Kitchen20'2" x 15'2" (6.15m x 4.62m). Dining Area10'9" x 8'3" (3.28m x 2.51m). Media Room18' x 11'6" (5.49m x 3.5m). Pool Complex38' x 20'4" (11.58m x 6.2m). Utility Room14'6" x 7'2" (4.42m x 2.18m). Master Bedroom15'1" x 14'4" (4.6m x 4.37m). En suite One9'9" x 9'1" (2.97m x 2.77m). En-suite Two6'8" x 5'4" (2.03m x 1.63m). Bedroom Three15'4" x 10'2" (4.67m x 3.1m). Bedroom Five13'3" x 11' (4.04m x 3.35m). Bathroom9'5" x 7'4" (2.87m x 2.24m).